Bel Air South is packed with many adventures and historic sites for you to visit including the Tudor Hall. While you are here, you do not have time to nurse a toothache or jaw pain. Because of that, you need to know that there is a solution for you and there is. There are many dentists and specialists available in Bel Air South. Each one is ready to see you and help you overcome your tooth pain. The team at emergencydentistsusa.com wants you to have the information you need about dentists available at your fingertips. To do this, we created a list of local dental providers from general dentists to specialists in orthodontics, periodontal treatment, and more. All you need to do is take a moment to check out the list. Should you not have a moment to do that, call our hotline for free today. When you call into our hotline, you will speak with one of our compassionate and friendly team members. We will help you choose a nearby dentist and schedule your first appointment for you. We do recommend that you bring your current, valid ID, insurance card, copayment, and list of current medications with you. You should arrive about 15 to 20 minutes ahead of your appointment time to fill out any paperwork. If you experience any type of tooth or jaw pain in Bel Air South, you need to know that there is a provider available to help you. Fortunately, there is and you will be able to choose from endodontists, family dentists, pediatric specialists, oral surgeons, and more. Typically, when you first experience a problem with your tooth, you will see a general dentist. 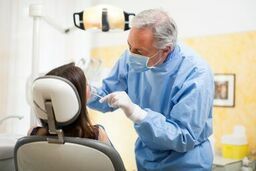 Should that dentist not be able to provide you with the care you need, you will be referred to a specialist who can help you. Description: Abingdon Family Dentistry is your source for all of your dental needs. We can see you and your entire family under one roof. We provide you with comprehensive dental procedures from same day crowns to cosmetic dentistry and even no drill fillings. Your smile is our number one priority. Description: Aesthetic Family Dentistry of Bel Air is committed to providing you with the best care. We specialize in general dentistry, but also offer emergency dental procedures for patients who are experiencing an emergency both during and after business hours. Our dentists care about your smile and will do what it takes to make sure it is as healthy as can be. Description: South Main Street Dental provides each one of its patients with outstanding care and compassion. We service patients of all ages in our office and we provide comprehensive dental procedures to meet your needs. From cleanings to oral surgery, we are here for you and ready to provide you with an individualized treatment plan that addresses all of your concerns. Tooth pain is not something you want to ignore and if you have been in pain for two or more hours, it is time to get checked out. If you have tooth or jaw pain related to an accident that you were involved in, you should visit the ER first to ensure that you do not have any serious injuries or broken bones. Before you visit any new dentist, you should check out their licenses and credentials first to ensure they are valid and active. To do this, you should visit the Maryland Dental Association website and perform a search of the dentist’s name.